Monday started with me trying to match a bunch of clock movements with their cases and dials. I did not imagine the task was so complicated! Years ago I picked up the entire stock of a clock maker who had closed shop. 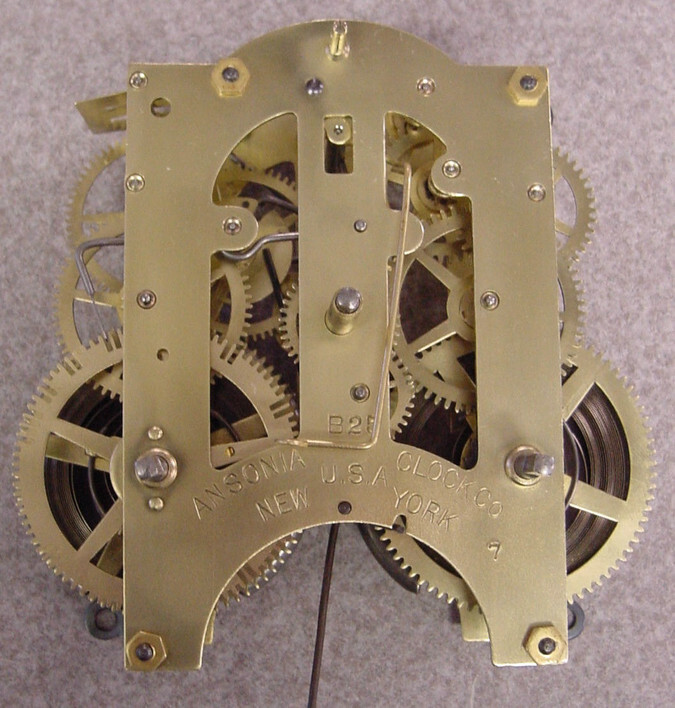 This comprised of a huge amount of movements – the mechanics that make a clock work, and an assortment of clock cases. I assumed I would be able to do the matching of movements to the cases quite easily, but the years between acquiring the lot and putting them together had resulted in an additional problem of monumental proportions. Mud from termites, rust, grease and fluff had caked the parts together. Cleaning each movement and then doing the necessary repairs gave me some satisfaction. I had decided to work on a particular type of clock called a ‘Dial’ clock or the ‘Gallery’ clock as they do in America. Gallery clocks have a plain round wooden case. They are simple and elegant, the wood work essentially the same as that of the Drop Octagon, with the corners rounded off, and the extra drop eliminated with a smaller pendulum. The face is then turned in a lathe to round off and sometimes add embellishments like a turned bezel. 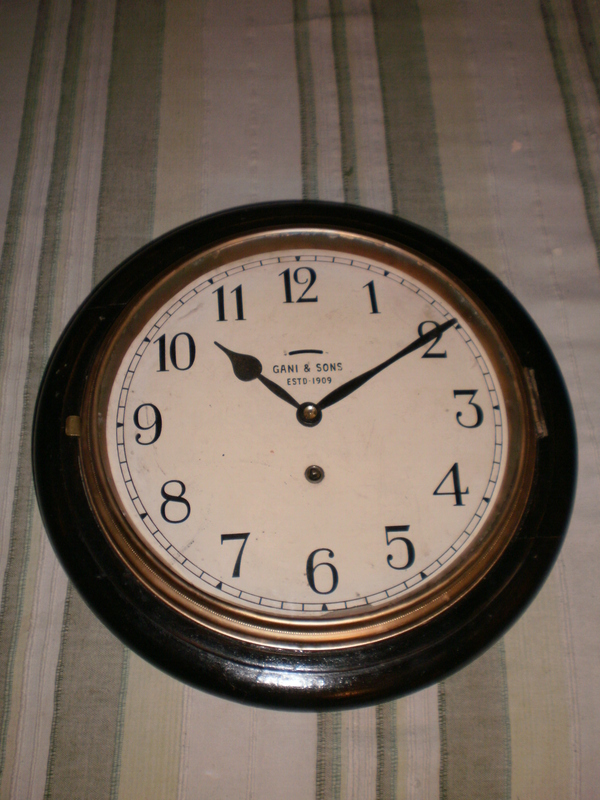 In most cases the case is a clean flat round rim of polished wood around a dial. A brass or steel bezel ring holding a protective glass is mounted on the case to provide access when setting the time or when winding. After getting the movements I thought belonged to particular cases I was confronted with another problem. Although the movements of many types and styles of clocks look similar – almost identical in some cases, they function with different pendulum lengths! For instance Drop Octagon clocks and a lot of Dial or drop Dial clocks have virtually identical movements. The only difference is in the gear ratios that allow for longer or shorter pendulums. And it is virtually impossible to tell unless the movement is timed to determine the correct pendulum length! And this was what I was up against! So I nailed a board to the wall and mounted the movements that I serviced on the board. Then it was a job trying different pendulums and timing each. Its not hard to get an approximate length of pendulum required. Doing the final regulation takes time as the job requires monitoring over a period of a few hours and sometimes days before one can set the clock to function accurately. Of course there is much joy and satisfaction in going through all these complicated procedures. So different from a battery operated clock or watch! But that’s the difference between one of these mechanical masterpieces and their characterless electronic replacements! Out of the five movements I serviced, three belonged to Drop Octagon clocks and not their Dial cousins! After matching the selected movements again with their cases, I put them back on to their testing board while I set about sprucing up their cases. One needed the back board replaced and the other needed joints to be tightened up again. Then it was time to give them a light sanding to get them smooth after the touch up. Bits of hardened glue , scuffing and abrasions all had to cleaned off and smoothed. The sanding also prepares the surface to accept the French polish that gives the wood a nice gloss while emphasizing the grain in some cases. Polish also acts as a preservative by replenishing the natural oils and waxes in the wood. Then the brass bezel rings that hold the protective glass that cover the dial had to be buffed and polished till they shone again. And now to get some round disks of glass cut to fit into those bezels! This is something that I could not do at home. So it was off to find a guy who made picture frames. Fortunately he had the required attachment to cut circles out of glass. Not many of these guys keep this compass like tool to cut circles! I was told they do not have circular picture frames! ‘Then why do you have this tool? ’ I asked. ‘For people like you’ he replied! Then he thought for a bit and said that they do get orders for circular mirrors. Apparently people like to have circular mirrors in their bathrooms! Anyway, the dial clocks got their bezels and glasses and now are ticking merrily on the wall! 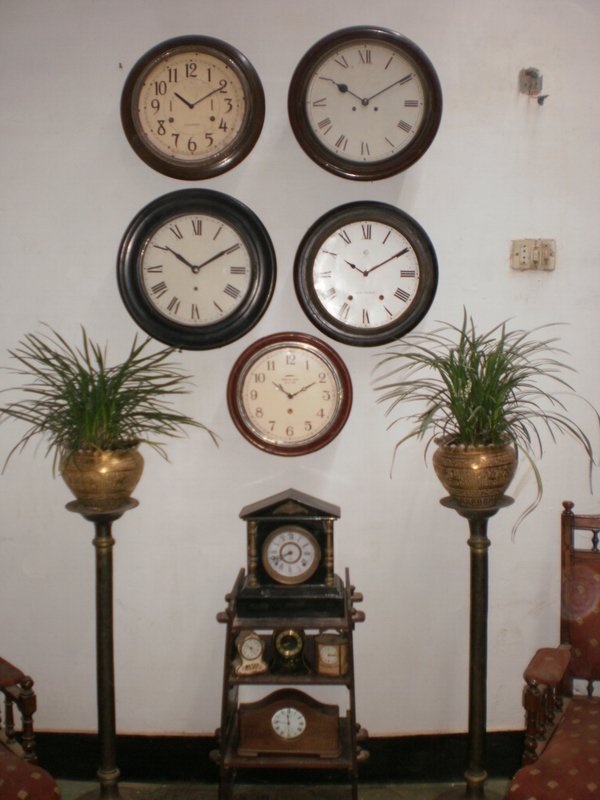 These clocks are a bit tricky to set up and will stop working if they are not exactly vertical! And this depends on how the movement is mounted and set up initially. I got some requests to examine clocks that stopped working immediately after they were brought back from a clockmaker. The problem was that the ‘crutch’ was disturbed when in transit. The ‘crutch’ is a link between the escapement and the pendulum and the crutch needs to be set when the clock is vertical. If this is not set, the clock goes out of ‘beat’ (and uneven ‘tic toc’ ) and eventually stops. A Platform Escapement on a movement. 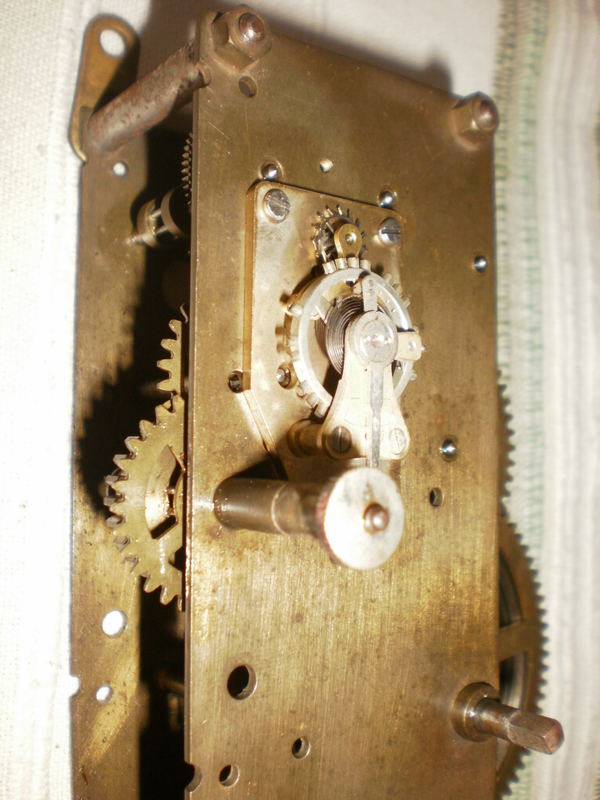 Setting the crutch in a Dial or Drop Octagon clock involves removing the hands and dial. Not a pleasant task after everything is closed up and looking good. To deal with these problems some slightly ‘improved’ designs had clocks with platform escapements that needed no pendulums and worked in any position. And now I have just discovered I have two Dial clocks in my collection with platform escapements in my collection that need attention! I’m going round in circles.